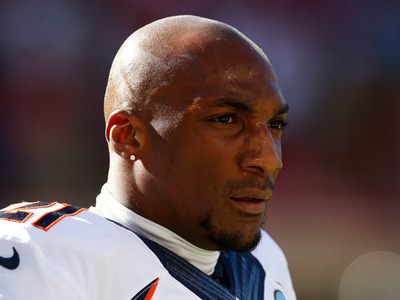 Over the weekend, reports came out that Denver Broncos cornerback Aqib Talib had been shot at a Dallas nightclub. Talib was taken to the hospital, then later discharged, and indications were he would make a full recovery from the gunshot wound in his leg. However, since, strange details about what exactly occurred early Sunday morning have been emerging. According to Mike Klis of 9News, Talib told friends that he accidentally shot himself in the leg. Police are still investigating. Prior to Klis’ report, there was speculation that Talib might have shot himself, with ProFootball Talk’s Mike Florio writing that it was “one of the first rumours making the rounds among players” when news of the shooting broke. It’s difficult to tell if that’s realistic or not because the details of what happened are hazy — even to Talib himself. According to Klis, there is an unknown suspect in the shooting at the Dallas nightclub where it was originally reported that Talib was shot. TMZ released video from the the V Live club in Dallas, where an argument took place before four shots rang out. Two were injured in that shooting. Talib missed the Broncos’ visit to the White House on Monday for winning the 2015 Super Bowl. Talib will miss the rest of offseason workouts as he recovers.